Meet John Hansen, mudslinger extraordinaire. 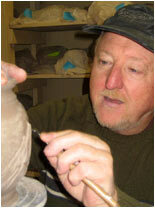 John, who opened Mudslingers Pottery School and Gallery in 1997, has been making pottery in Historic Downtown since 1978. Mudslingers is located at 920 Main, underneath the awesome gift store, By Chance. Drop in and get your hands dirty! You talkin’ to me? 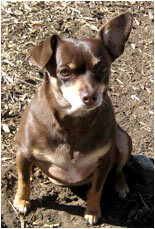 Meet Chihuahua-mix Coco – affectionately known to her 900 block neighbors as Coco Loco. Coco guards the north entrance to Historic Downtown from her turf at Main and South Streets. Make sure to say hola next time you pass by! LOOKING FOR GREAT VALENTINES DAY GIFTS? Many of our retailers have wonderful, unique gifts for the ones you love. Here’s a few of the specials going on before Love Day. From hammered silver to Victorian antiques, Denver artist, Denise Midroy makes jewelry that is fun, perky and stylish. Enjoy wine and cheese and don’t forget to purchase your Trollbeads too. If you haven’t stopped by this newcomer to Main Street, now’s your chance. Sweets and a glass of wine to celebrate and lots of unusual gift ideas and good deals. A selection of gorgeous jewelry from a mix of vintage and new pieces made by Mysti Gulsrud, a Longmont artist. Prices are approximately $30 – $70 for necklaces and $18 – $40 for earrings. For each piece you purchase your second piece is half off. A large selection of Anne Taintor items, such as heart candles, bracelets, pocket charms and bath salts. Plus lots of other fun and interesting ideas perfect for your loved one... or treat yourself! It’s the Love Issue. The Downtown businesses and organizations are really sharing the love this month with so many ideas for LOVEly gifts and sweet things to do. Almost all the restaurants have Valentine’s Day specials. Check their websites for details. Just makes us want to hug everyone!!! Creations Gallery will hold a gala opening and evening reception for award winning pastel artist Colleen Hoerner, among sixty Colorado artists showing at the gallery. Creations features new artists almost every month. New work by Anthony Grant will be featured at an opening reception. Featuring artists Frederic Bender and Donna Flebbe at an evening reception. Just in time for First Friday, Coppersmith Angela Facciotti opens the doors to her new gallery and also hosts artists Melissa France, Mark Heath, Bruce Shaver, Tony Finocchio, and Ashley Honeyman. Come get to know our newest downtown residents and enjoy food and drink. Learn how to borrow and return digital library books on your Kindle® or iPad. This class will be full of tips and tricks on browsing and searching for books in the digital library, Overdrive. You will learn to place holds, retrieve holds, and troubleshoot issues that may occur when using your Kindle or iPad to check out eBooks from the digital library. Registration is not required. NOTE: If you have a laptop, please bring it along. Author Ethan Casey will discuss his travels and experiences in Haiti. "As an eyewitness, Casey gives readers an informed perspective on many of the political and social complexities that vex those who seek to make common cause with Haiti, our oldest neighbor, as it seeks to emerge from decades of strife and one of the most devastating natural disasters in recent history." –Dr. Paul Farmer, co-founder of Partners in Health and author of Haiti After the Earthquake Synopsis. Co-sponsored by the Colorado Haiti Project. 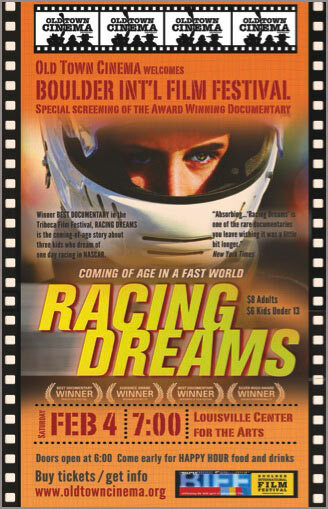 Bring the family to the pre-festival special event screening of the award winning 2010 BIFF favorite, RACING DREAMS. Win tickets to closing night at the 2012 BIFF event at the Boulder Theater! Come early for Happy Hour at OTC Café! Stay after for talk-back! Buy tickets at www.oldtowncinema.org. In association with the Colorado Brewers Guild, Lucky Pie will tap 4 Firkins from Bristol Brewing, Left Hand Brewing, Avery Brewing and Black Fox Brewing. Cost is $20 per person and includes a glass of each beer, munchies and a chance to meet the reps of the four breweries. And if you don’t know what a Firkin is, now’s your chance to find out! Proceeds benefit the Colorado Brewers Guild. Chef Deb is at it again, this time with tasty casseroles like the King Ranch Chicken Casserole, Ham and Leek Meat Pie or one-dish Pinto Bean and Sweet Potato Chili. Just what we need to warm our hearts. Finish it off with Sticky Toffee Pudding with Bourbon Whipped Cream for dessert. Fee is $20. Visit any of the participating restaurants throughout Louisville for breakfast, lunch or dinner and help fund the home heating bill for Louisville seniors in need. Ten percent of your tab will go towards this great cause so take part! Downtown participating restaurants include: The Cactus Wheel, Zucca, The Empire, Old Louisville Inn, Waterloo, The Huckleberry, Café de Paris, LuLu’s, Lucky Pie, Bittersweet, Blue Parrot, The Louisville Rex and The LoCoYo. Enjoy the country music sounds of the Whitney Mann band, wine, beer and local eats and a photo exhibit. Sponsored by Assorted Goods & Candy and Sassafras Photography, all proceeds benefit Impact on Education. Cost is $30 per person or $45 per couple and includes 1 drink. Call 303-524-3865 for more information. Nancy has been a performing musician for many years, working in combos large and small, playing western and standard swing music, old-timey and Cajun dance music, and folk and bluegrass music. Nancy has a true talent for composing songs which fit perfectly within the genre, so her original numbers are always highlights of any show. Admission is $12 adults; $8 seniors and students; $5 youth. Open March 1. But February is Submission time. Interested families who want to help their kids submit their artwork should click here. Children who practice yoga have been found to have less stress, more self-acceptance and a more positive outlook. Three different yoga classes for tots, kids and tweens will be offered. Fees are $64 for younger kids; $72 for ages 7 – 13. Chef Sunana Batra will unravel the mystery of Indian cooking in this first of two demonstrations. Mint Chutney is a versatile condiment used on many dishes. Samples of Aloo Tikka (potato fritters) and Spinach and Onion Pakoras to dip will be available. $25. Mark your calendars for March 10 for a lesson in Bhel Puri, an exotic south Indian crunchy snack made with all kinds of ingredients. Savory Spice Shop Boulder owner, Dan Hayward, will teach about using spices to add interesting depth and incredible flavor to both sweet and savory cooking. He’ll present a brief history and tasting notes, followed by a dish using those spices. $20. Nathan Miller, formerly the Head Pastry Chef at The Kitchen in Boulder, a Culinary Institute of America graduate and a Jean-Georges alum, will share his expertise on and enthusiasm for chocolate. Includes a 4-pk of gourmet truffles to take home. $30. Nathan Miller and Shannon Aten of Tasterie Food Truck will treat you to this all- inclusive dinner that includes: Herb Salad with pumpernickel croutons, pears, walnuts and bacon dressing, Ratatouille, Israeli Couscous and Lemon Meringue Tartelettes. Cost is $45 per person. Mention code: LOVE for $5.00 off per person for parties of 2 or more. Teachers and students will take part in this evening filled with exotic dances from tribal to cabaret to fire dancing and belly dancing. All paired with excellent Moroccan food. There will be two seatings for this special event; 5 – 7 pm and 8 pm to close. Tickets are $21.99 or $24.99 depending on the seating time. Reservations at www.ImperialFezColorado.com.